Russia’s Evgenia Tarasova and Vladimir Morozov perform their long program at the 2016-17 ISU Grand Prix Final of Figure Skating. 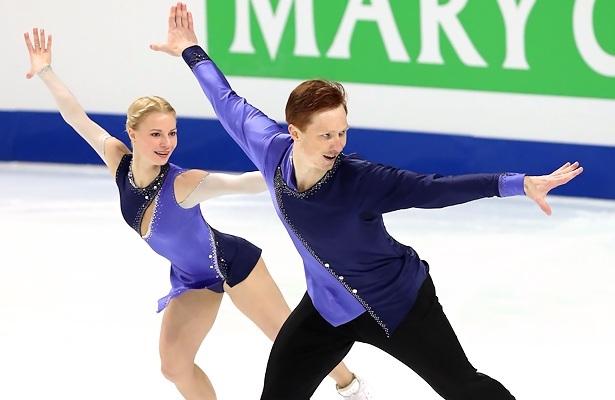 Russia’s Evgenia Tarasova and Vladimir Morozov achieved the first major victory of their career, finishing first in Marseille, France, ahead of the new Chinese team Xiaoyu Yu and Hao Zhang, as well as World champions Meagan Duhamel and Eric Radford of Canada. The students of Nina Mozer, Andrei Hekalo and Robin Szolkowy were flawless in the short program set to “Glam” by Dimie Cat, but made mistakes on both jumping passes in the long. Still the skaters count the performance in the long as a success. The team opened the performance to the music by John Miles with a strong level three quad twist and nailed two strong triple throws to earn 213.85 points in total, updating their personal bests in all three categories. Yu and Zhang also skated a clean short program, but made mistakes in the long, missing the first triple toe and the final spin, which received zero points. The team picked up 206.71 points, their new personal best. Despite being in a new partnership and having skated together for such a limited time, the team already shows a lot of potential to develop into strong lyrical skaters. Duhamel and Radford struggled with both their programs and had to settle for the bronze medal, despite having the highest base values in the field. Duhamel stumbled out of a triple Lutz landing and fell on throw triple Axel in the short. In the long, they missed both jumping passes and had a shaky landing to the throw quad Salchow. “It wasn’t the way I wanted to have my birthday go,” she added. The team, who has opted to do the hardest triple throw, believes that they might reconsider their strategy. The two-time World champions were disappointed with their performance, even though overall the long program looked rather solid and they earned 205.99 in total. Canada’s Julianne Seguin and Charlie Bilodeau finished fifth with 186.85 points. The students of Josee Picard and Marc-Andre Craig went back to their entertaining short program from last season, “Monde Inverse” by Cirque du Soleil. The Canadian silver medalists missed both the jump and the throw in the short, but had a better performance in the long, where they missed only the opening triple toe loop. China’s Cheng Peng and Yang Jin finished sixth with 183.19 points after a disappointing long program in which they missed both jumping passes and a lift. However, just like their teammates, they also looked very promising, especially in their quirky short program.